Applicants must complete the application and submit a notorized authorization. The Corporate Application must be completed by all companies/groups/individuals wishing to solicit in the Village. 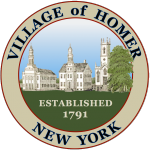 The Homer Village Clerk’s Office issues certified copies of birth, death, marriage and divorce certificates to qualified individuals. Applications can be submitted via mail or in person at the Village Clerk’s Office.